Richard Propes of The Independent Critic reviews Justin Hannah's "Consignment"
Richard Propes of The Independent Critic posted this incredibly insightful review of Justin Hannah's "Consignment." The Independent Critic features Hollywood and independent film reviews, celebrity interviews, and film festival coverage from Richard Propes. Propes, an award-winning writer and activist, has served on the juries for Fylmz.com, Indiana's Lake County Film Festival, The Indianapolis International Film Festival, and Indy LGBT Film Festival. If you watch writer/director Justin Hannah's short film Consignment the first time through and think to yourself "I've got it," then more than likely Hannah has simply drawn you into this dark yet mesmerizingly beautiful story about possession and illusion and longing and, indeed, about the darkest parts of love. 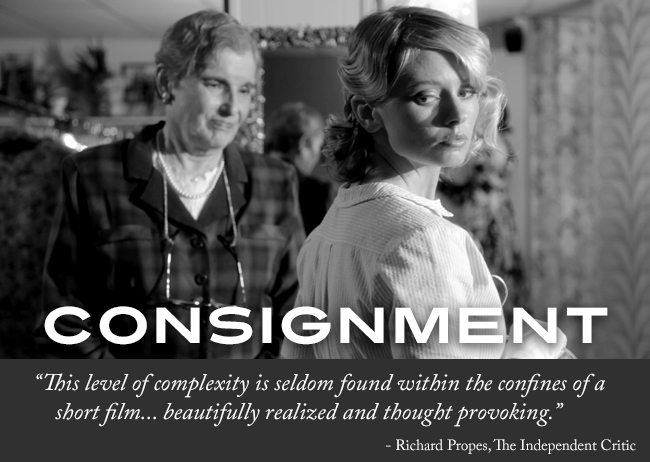 I would dare say that you haven't "got it," but Consignment is such a deceptively simple film that it's easy to believe that having surrendered to its cinematic experience has led to your somehow understanding a film that almost transcends understanding. Margaret (Abbra Smallwood) is a classically beautiful blonde whom we meet in a consignment shop. This is symbolic, but then again maybe it's not. She looks serene and vulnerable, yet there is a dark aura that surrounds her and music from Robert Casal that makes it almost undeniable that there is much more going on than simply Margaret in a consignment shop.